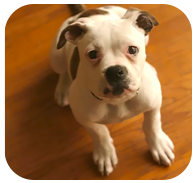 One of the most popular and family-friendly bulldog breeds, the American Bulldog is a reliable and loyal pet who loves children. This dog should have a strong, dominant master so as not to become aggressive toward other dogs, and early socialization to develop healthy relationships with house guests and appropriate behavior toward strangers. Daily exercise is also recommended to moderate this dog’s energy levels. 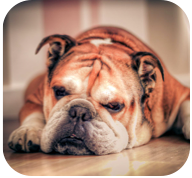 English bulldogs may look tough, but they tend to be among the most agreeable of their breed. While taunting and teasing can arouse some aggression, it takes quite a lot to do so. That said, English bulldogs know their family well, and can be an intimidating force for intruders to their home. These dogs tend to be very stubborn and persistent, with one of its most determined activities being human attention and affection seeking. This dog’s owner should give him plenty of attention to keep him happy, and maintain strong dominance to ward off guarding behaviors. Mixing with other pets may be fine, though some male English bulldogs can be aggressive toward other male dogs of any breed. Sometimes called the Original English Bulldogge, this breed likes to know that he is important to his family. These dogs tend to be bold, energetic, and somewhat fearless. Regularly, owner-led exercise is a must for this breed. Owners should be calm, loving, consistent, and always assertive to keep this dog from becoming overly stubborn. 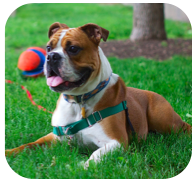 A well-trained Olde English bulldogge is confident, alert, and generally friendly. 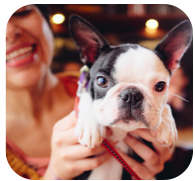 The adorable French bulldog tends to be a playful and easy-going family pet. Affectionate and loving of human attention, this dog is generally agreeable around other animals and strangers but is happiest in the company of its owner. Passive owners can expect their French bulldog to become stubborn, and possibly aggressive, so strong leadership is essential. Children should also know to display leadership with French bulldogs to keep these pets from feeling that they need to be leader of the home. Dog breeds often confused with bulldogs, but are genetically very different, include the boxer, American pit bull terrier, and Boston terrier. Click "Read More" to see the full list of breeds.